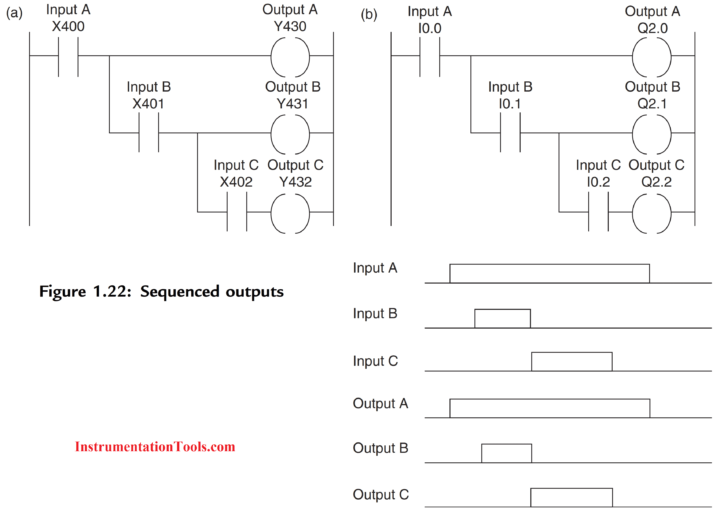 PLC Multiple Outputs Configuration useful for PLC Sequence of Outputs or Sequence Logic, PLC Ladder Rung with Two Outputs, PLC Ladder Rung with two inputs & two outputs. With ladder diagrams, there can be more than one output connected to a contact. Figure 1.20 shows a ladder program with two output coils. When the input contacts close, both the coils give outputs. In Some cases it is required to start two pumps in parallel by pressing a single start button then the above logic may be useful. For the ladder rung shown in Figure 1.21, output A occurs when input A occurs. Output B only occurs when both input A and input B occur. Say we have a Single Start button to Start two pumps in parallel. But we have extra Start Permissive for Pump B only and it must be started on satisfying the permissive only. Note that there is no permissive for Pump A in the above example. So Pump A will start on Pressing Start Button and Pump B will start on Satisfying the Start Permissive & with Start button pressing. Such an arrangement enables a sequence of outputs to be produced, the sequence being in the sequence with which contacts are closed. on as the contacts in the sequence given by the contacts A, B and C are being closed. Until input A is closed, none of the other outputs can be switched on. When input A is closed, output A is switched on. Then, when input B is closed, output B is switched on. Finally, when input C is closed, output C is switched on. The above logic will be useful in sequence logic’s. For example for conveyor belt action, Bag house logic, Sequence of on/off valves operation etc.